The Oval at Kennington is known the world over as a top class cricket ground, holding the first international test match in England, but it played an important part in the development in international football too. The same person, Charles Alcock, was behind both events. At the time Alcock was playing and organising affairs for both cricket and football. He invited Scottish clubs to send a team to England but there was little response, partly due to the cost of arranging the visit and partly because of differences between the rules adhered to in both countries. In the end the side that contested the first international game at the Oval in 1870 consisted mostly of Scots playing their football in England. 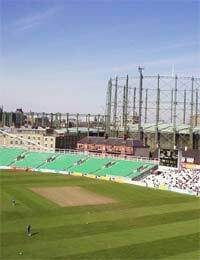 Nowadays associated with the giant gas holders that have dominated its boundaries since 1853, the Oval was built during 1845 and saw its inaugural first-class cricket match in 1846. The ground was built by the newly inaugurated Surrey Cricket Club on ground rented from trustees to the Duchy of Cornwall, in land in South London that had previously been a market garden. There is some controversy surrounding the first international football match although there is no dispute that it was between England and Scotland. The Oval did in fact host four matches between the two countries before the first match to be played in Scotland but those matches are not recognised by FIFA. This is partly because the English FA were arranging the whole thing, even down to picking both sides. The first recognised international match was therefore the one held in Glasgow in 1872 when the English FA sent a team in response to an invite from Queen's Park FC. The return game at the Oval in 1873 therefore stands as the first official international football match on English soil. Once established the national rivalry carried on and in 1879 Wales joined in, playing England at the Oval and losing two-one, with Ireland soon coming to what became the British Home Championship. The Oval remained the default home of the English national side in the south until 1889, the last match being another defeat by Scotland, this time 2-3. Other grounds had been used around the country for international matches, mostly in the north-west, then in the midlands, as the game spread and newer, grander stadiums began to rise up. After that last match in 1889 internationals in the south used a number of different club grounds until 1923 when Wembley was opened. In 1872 Charles Alcock went on to become the Secretary of Surrey Cricket Club and repeated his success with international cricket. The first international Tests, between Australia and England, had been played during a tour of Australia at the Melbourne Cricket Ground. Alcock saw to it that the return tour in 1880 would include a Test at the Oval, so he was able to repeat his football feat in the cricket world. At the same time he was very active in the FA and instigated the FA Cup, ensuring that the final was held at the Oval, of course, in 1872, and for the following twenty years.